Our website, http://www.mvquilters.org, is one of the best places for information about our guild. If you can’t find the info here, contact the person in charge of the activity you are interested in. Their information can be found on the Committees Page or Board Member Pages. This website is what is known as a blog (short for weblog). As such it has two distinct parts; Posts and Pages. Posts are what you find under the home tab and generally are the first thing you see when you enter our website. Posts are added as needed to immediately get information to the members. Posts are listed chronologically. Pages are the information under all the other tabs at the top of the page. Pages generally don’t change often. They contain information on the day to day functions of the guild. Board Members, Workshops Schedules, Guild Activities, Projects, etc. When you use the search area on the right of the blog, it searches posts only. If you don’t find what you are looking for in your search results, check the menu of pages to the right. Most likely it is listed there. If you are still having trouble, email one of our bloggers, they should be able to direct you to the page you are looking for. Sign in at the membership table. Be sure to have a name tag. Buy a chance at the raffle table. Check out other tables for information. The meeting frequently starts with the business meeting and announcements and is followed by Show and Tell. We then take a short break for refreshments and more opportunities to shop, get raffle tickets, or check out projects and activities. After the break, door and raffle prize winners are drawn. The final event is the evening’s program. When we have a Speaker, their presentation will often come first followed by a break and then the business meeting. Patterns for the Hatchet block name tag will be available. Name tags are needed to win door prizes and help other members match names and faces. Numbers are drawn after break and the person holding the correct ticket wins! You must be wearing your name tag in order to win. Contact Membership Committee. The guild president leads this section where the guild’s business is conducted, announcements are made, programs explained and news announced. Keep a pencil and paper handy for notes. We try to keep this brief and have details available at tables in the hall during break and on the website. Contact Guild President. Sharing of recently completed sewing projects. Pictures of show and tell projects will be posted on our facbook page. Each month the newsletter publishes which group of people (alphabetically by last name) are responsible for refreshments. Bring a snack of your choice. This is voluntary and you may bring refreshments to any meeting. Contact Jeanne Elliot. Current Year – Each year we create a quilt to raise funds for the guild. 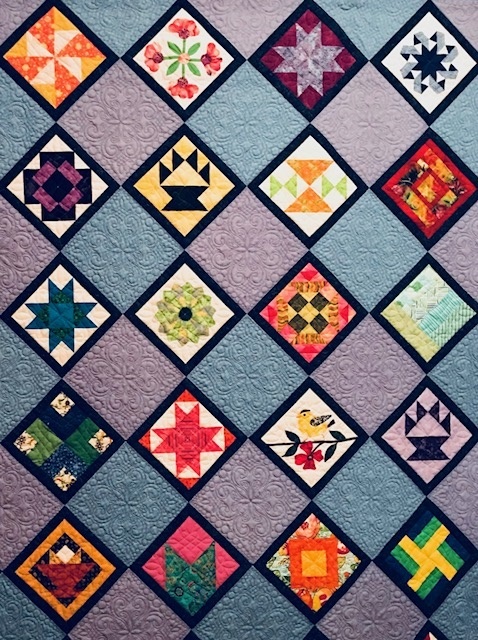 This quilt is taken to quilt shows and community events where tickets are sold. We are always looking for places to take the quilt. If you know of an event in your community please let us know. Future – Members make a block to contribute to the construction of the new raffle quilt for next guild year. Sign-up to get the instructions for the block. Frequently, there is a nominal fee for the block. This fee will be returned to you once you have turned in your completed of the block. Blocks are due no later than January’s meeting. Submit them sooner if you can. Contact the next years Raffle Quilt Committee. What are the Guild Programs, Activities, Events and Workshops? Workshops – Are held several times a year and are often given by that month’s speaker. They are typically $25 and are usually held on the Saturday following the guild meeting from 9:30-3:30 at various locations. Some teachers require a kit or pattern fee that is beyond our charge. Non members are welcome to be put on a wait list ($30) if the class is not full one month before . A Workshop list is on the website. Contact Program Committee. Who do I notify when a member is sick or has passed away or someone from a member’s family has passed away? The Sunshine Chairperson is responsible for sending special cards to the members of our guild. She will also coordinate meals and other special help if needed. Contact Sunshine Chairperson. How can I get to meet and know other members? Schedules are posted on here.